For the last few months everyone's focus has been on the Middle East. Between the marauding barbarism of ISIS and the escalating threat of a nuclear Iran, the world's attention has been centered on the region east of the Mediterranean Sea. Only the ongoing crisis between Ukraine and Russia has momentarily distracted us. But there is a simmering and ominous hostility growing in Eastern Europe that we must not dismiss. It is coming from Hungary, a country that we don't hear much about, but which deserves our scrutiny due to news surrounding its political environment. There is an increasing popularity among Hungary's youngest voters for a political party called The Movement For A Better Hungary, or Jobbik, as it is more commonly known. So, why should the world be concerned about Jobbik? According to Wikipedia, Jobbik is a Hungarian radical nationalist political party. The party describes itself as "a principled, conservative and radically patriotic Christian party", whose "fundamental purpose" was the protection of "Hungarian values and interests." Jobbik describes itself as rejecting "global capitalism", European integration and Zionism. Patriotism and Nationalism, by themselves, do not constitute a threat; indeed they can result in a pride that translates into changes for the betterment of any country. But when they are combined with strict biases against religions and the full participation of every citizen in the nation, then alarm bells should be going off. For their part, Jobbik has rapidly ascended to the second most popular political party in Hungary. They reject globalized capitalism, and the influence of foreign investors in Hungary. Jobbik specifically opposes Israeli and Jewish investment in Hungary, even to the point of protesting the World Jewish Congress's choice to locate their annual meeting in Budapest in 2013. Then there is the issue of what they call "public order." The Jobbik Party wants to greatly strengthen the National Police, and they once had strong ties to the Magyar Gárda militia, the paramilitary wing of the Party. This militia was founded through an "oath of loyalty to Hungary" by its members in August 2007, but was dissolved by the Budapest Tribunal in 2009. Their radical nationalistic ideology was well represented in the Party's 2009 election slogan "Hungary belongs to the Hungarians". But I discern cause for alarm when the editor of a police union newsletter (who was also a recent Jobbik Party candidate for the European Union parliament) prints the following: "Given our current situation, anti-Semitism is not just our right, but it is the duty of every Hungarian homeland lover, and we must prepare for armed battle against the Jews." In November 2012, the party's deputy parliamentary leader, Márton Gyöngyösi, posted a video speech on the Jobbik website in which he stated: "I think such a conflict makes it timely to tally up people of Jewish ancestry who live here, especially in the Hungarian Parliament and the Hungarian government, who, indeed, pose a national security risk to Hungary." In 2014, the deputy chairman of one of Jobbik's County organizations, referred to the Holocaust as "holoscam". And just this week, the Jobbik Party has won its first ever individual constituency seat in parliament. Considering that 550,000 Hungarian Jews were killed during the Holocaust, how would you feel if you were one of the 100,000 Jews currently living in Hungary? Even though you constitute the largest Jewish community in Eastern Europe, would you feel safe? Or would you feel that you were experiencing déja vu? Does anyone else see shades of the nationalist German movement that resulted in Nazism? Like the Nazi Party, the Jobbik Party opposes capitalism, and appears to resent the success and participation of Jewish businesses. And the suggestion by the Jobbik Party that Jews and those of Jewish ancestry be "tallied" is too close to the Nazi sentiment which called for a united Greater Germany that would deny citizenship to Jews or those of Jewish descent. 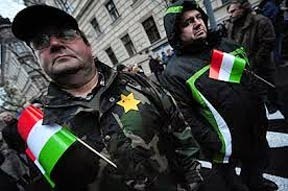 Will they soon institute the wearing of a yellow Star of David to identify all Hungarian Jews? Plus. who can deny the similarity of the Jobbik paramilitary wing to the Gestapo, the Nazi secret police whose job it was to investigate treason, espionage, sabotage and criminal attacks against the German state? For now, the World Jewish Congress is expressing its concerns about the rise of the Jobbik Party in Hungaray, while trying to keep the lines of communication open. But the resemblance to the rise of Adolph Hitler and the Nazi Party cannot be ignored. It has only been 75 years since the world chose to turn a blind eye to the popularity of a charismatic leader who proclaimed the need for nationalistic pride and for the eradication of the Jews. Surely, this time we will not be so slow to condemn the powerful surge of politics that will lead to another Holocaust! Now is the time to keep the wolf from the door! Malachi 3:6 "For I, the Lord, do not change; therefore you, O children of Jacob, are not consumed."